Hummus with a side of harmony. Out of dozens of popular restaurants in the Old City, Hendy Sohela of Sohel Hummus is the sole woman running her own business. The restaurant’s walls are decorated with Qur’anic verses, images of the Dome of the Rock and a mounted TV screen, which broadcasts footage from the Islamic holy sites in Mecca. Ancient Egyptians first mentioned the city of Acre in hieroglyphic carvings. In 66 CE, it was a base for the Romans when they crushed the Jewish revolt. Muslims conquered the city in 638, followed by Crusaders in 1104. Napoleon laid siege to it in 1799, but could not conquer it. Today, Acre still harbours religious diversity similar to that of Jerusalem. Yet Acre has its own unique social climate. People of all backgrounds enjoy equal opportunities in the city’s flourishing culinary scene. Sohela inherited the restaurant from her father, Abo Sohel, in 1993. 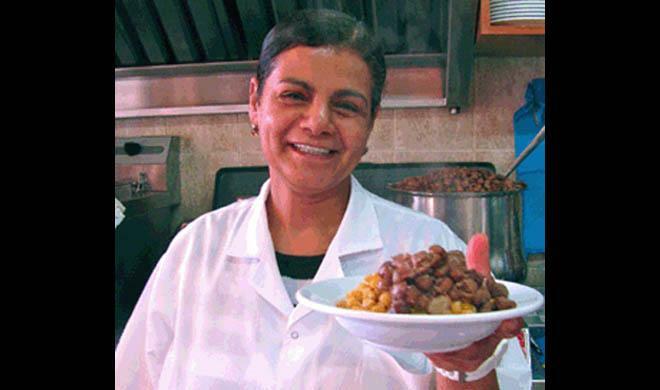 “It was hard to be the first woman running a hummus restaurant in the Old City. Hummus is a tradition in Acre. At first my family was against it,” said Sohela. “But my siblings supported me. After my father passed away, my mother became ill and one of my siblings went blind. It was up to me to uphold our family’s recipe.” In 2005, Sohela won first prize in a national competition hosted by Israeli celebrity chefs Oren Giron and Moshe Segev. She was awarded a plaque with a golden pita and her hummus was deemed best in Israel. According to the Israeli Central Bureau of Statistics, almost all of Acre’s Old City residents are Arab, around 20 per cent of the whole city’s population. On weekends the neighbourhood is packed with people from across the north, evenly split between Arabs and Jews. They flock to restaurants in the Old City, from hip new venues to traditional, family-owned places. David Harari, an official responsible for tourism in Acre, says the city annually attracts 100,000 tourists from all over the world. It’s home to numerous holy sites, including the Bahá’í Gardens at Bahjí, Saint George’s Church, the Jezzar Pasha Mosque and Or Torah, a Tunisian synagogue covered in art mosaics. A lot has changed since Sohela first took over her father’s restaurant across the street. Today, Makhol’s wife and mother also work at his family restaurant. He feels comfortable leaving the business under their control when he is away; it feels perfectly natural. → When in doubt – Lebanon! ← The subtle vibrance of Amman, Jordan.